On the one year anniversary of a neo-Nazi killing Heather Heyer by ramming a car into a crowd of anti-racists in Charlottesville, Virginia, a pitiable turnout of a couple dozen white supremacists gathered at a park in front of the White House today in the name of “white civil rights” and “free speech” — veiled phrases intended to distance “Unite the Right 2” from deserved accusations of racism. The protest, which started at 3:30 p.m. and ended almost as soon as it began, was dwarfed by hundreds of anti-racist protesters who held a demonstration on the other side of the park, as well as in other parts of Washington, D.C. The two sides were kept apart by a massive police presence, and metal barricades between the two sides of Lafayette Square. Despite the numerous setbacks, Kessler was still intent on speaking to “President Trump at the White House” today, and proceeded to go on a tirade about the supposed grievances white Americans face. Kessler listed the New York Times editorial board hiring tech writer Sarah Jeong — whose old jokes about white people instigated an outrage among some in media — and Charlottesville police mishandling last year’s “Unite the Right” as examples of so-called anti-white civil rights abuses. He also disavowed the white supremacist label and claimed his rally was not about hate. 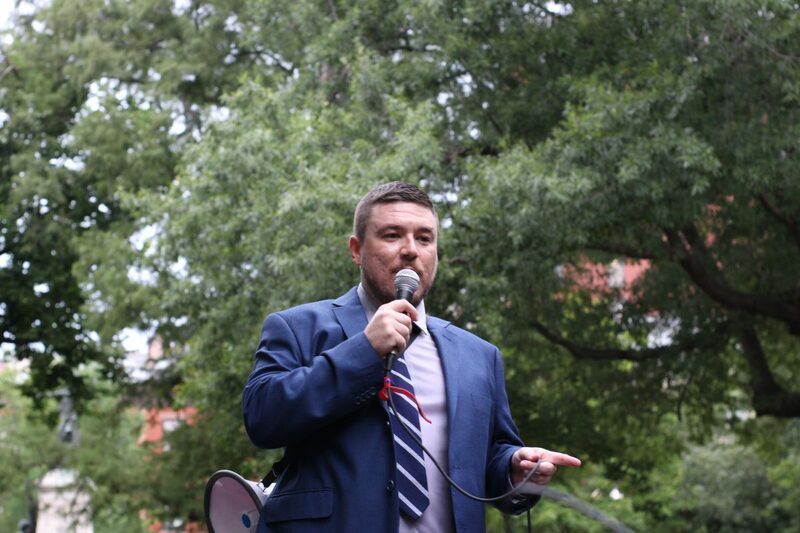 Kessler’s followers apparently didn’t get the memo, however, as numerous attendees flaunted neo-Nazi slogans and symbols in pamphlets and tattoos. While last year’s rally featured flags from nearly every faction of the white supremacist movement, “Unite the Right 2” only featured American flags and a number of President Donald Trump’s signature “Make America Great Again” hats. When asked if they believe Trump is empathetic to their cause, a white supremacist who would only identify himself as Parker said the president was fighting the “diving and conquering” of white people, who are supposedly being “destroyed” by changing racial demographics. Given that Trump did not call white supremacists out by name and instead condemned “all types of racism,” three “Unite the Right 2” goers who spoke to Mediaite said the president’s tweet was not an attack against their cause. While the event was scheduled to start at 5:30 p.m., the white supremacists wrapped up their speeches and were escorted out of the area by police at around 5:00 p.m. due to heavy rainfall.